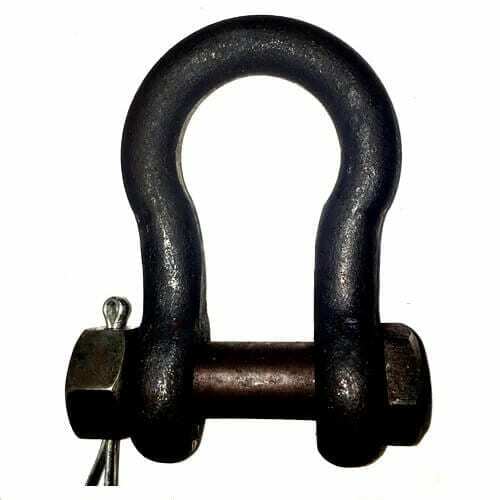 These British standard large bow shackle safety bolt type are one of the safest shackles to use on a long term basis. Due to the fact that there is a cotter pin which passes through the nut and bolt, it cannot un-screw itself like a standard screw pin type shackle can. These bow shackles are great for use with web slings as the correctly chosen size will seat nicely in the bowl of the shackle. (you should not lift on the pin). They can also be used with other types of slings, fittings and connectors as well as fitting directly to hoisting equipment; for example you could use this shackle to directly connect a lifting magnet to a hoist, no sling required! 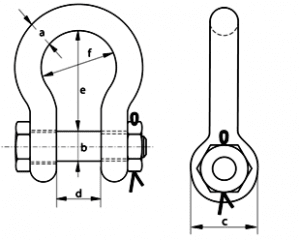 The type ‘E’ safety bolt and nut pin are produced from high tensile steel and comes available in either a hot dip galvanized OR self-coloured finish. They have a safety factor of 5:1 and certification is available. There is a good range of working loads available for this particular lifting shackle, ranging from 0.15 to 15 tonne with many intermediate sizes to choose from. 01384 78004 is the number to call for shackles, ropes, fittings, lifting gear and other related products. Our team will talk you through the ordering and payment process and you will be all done in a matter of minutes, then you can sit back and wait for your order in a couple of days. British Standard Large Bow Shackle Safety Bolt Type Overall rating: 5 out of 5 based on 6 reviews.